Nostril piercings are one of the most common facial piercings available, possibly second only to the earlobe in terms of popularity. Healing is relatively easy, if sometimes slow--about three to four months on average. But all piercings, even well-cared-for piercings, can develop complications as they heal. If you have a bump near the site of your nostril piercing, it could be caused by one of several different conditions. Fortunately, most are minor. If you're having any sort of trouble with your piercing, your first impulse may be to take your jewelry out--and if you see a doctor, he may ultimately tell you to remove your ring. But the Association of Professional Piercers suggests that removing jewelry should be a last resort, as it can cause further complications down the line, including scarring and even an abscess. Most piercing complications can be resolved with the jewelry in place. 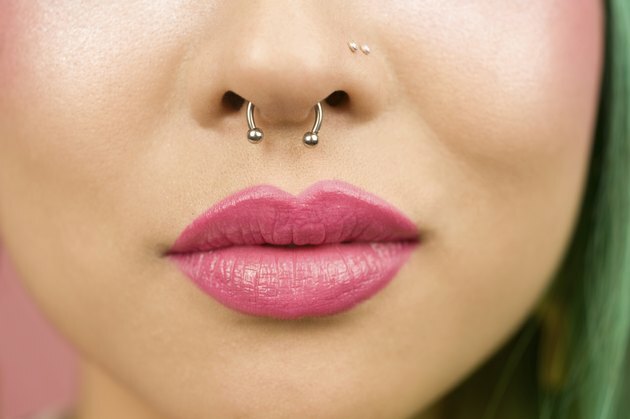 Most likely, the bump next to your nostril piercing is a granuloma. Elayne Angel, author of "The Piercing Bible," describes granulomas as looking "like raw hamburger"--red and raw. Granulomas are benign overgrowths of regular body tissue. They bleed easily but are often not particularly tender; they may drain clear or yellow fluid. A buildup of scar tissue could also cause a bump near the site of a nostril piercing. Some people are prone to keloids, which are a type of raised scar. They tend to run in families, and people of African and Asian descent have a higher incidence of keloids than others. If you had trouble with infections or trauma to your piercing earlier, and the bump isn't tender or draining any fluid, it might be a keloid scar. There's also the possibility that a bump next to your nose ring is a pustule or abscess. If the bump looks pink and feels tender or looks like a pimple, it may be a pustule--a localized pus-filled sore or "piercing pimple." Very occasionally, a piercing may become infected and, if left untreated, may lead to the formation of an abscess--a hard marble-like lump beneath the skin caused by the body's attempt to encapsulate and isolate a chronic infection. Granulomas and pustules can be treated at home. The first step for both conditions is a saline soak. Follow the directions given by your piercer in his aftercare instructions, but instead of soaking once a day, soak your piercing up to three times a day. Pustules, because they are essentially a very tiny localized infection, may be resolved with topical use of an antibiotic cream or gel. Keloids and other scar tissue formations, unfortunately, are harder to resolve--it's probably best to consult a dermatologist. An abscess is a serious medical condition that warrants a doctor's care. Seek medical assistance if you've tried home treatment with no improvement after two or three weeks or if the lump seems to be getting larger instead of smaller. If you're running a fever, see your doctor as soon as possible. Do the same if there are dark read streaks on your skin near the piercing site or if there is a large amount of thick, smelly discharge.